It’s the time of the year where we gather together with family and friends. 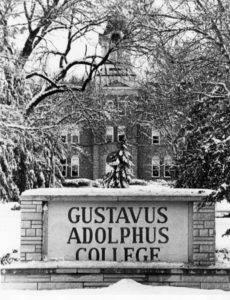 Here on campus, you may be partaking in a department party and joining in a Gustavus holiday celebration. Enjoy this time of connecting in fellowship celebrating the end of the semester, the end of the year, and the bright promise of 2018. I encourage you to reach out to a colleague that you haven’t talked to in a while, or a special emeritus faculty member. Revel in this time of community on campus and in your personal life. Looking for additional ways to connect in the New Year? Create an event – coffee, an outing in the Cities, dinner party, etc. And these fun tips too! Wishing you a joyous season and brilliant start to the New Year.